For over 35 years, countless water sports centres around the world have relied on TOPCAT to provide the ideal boats for training and rental. 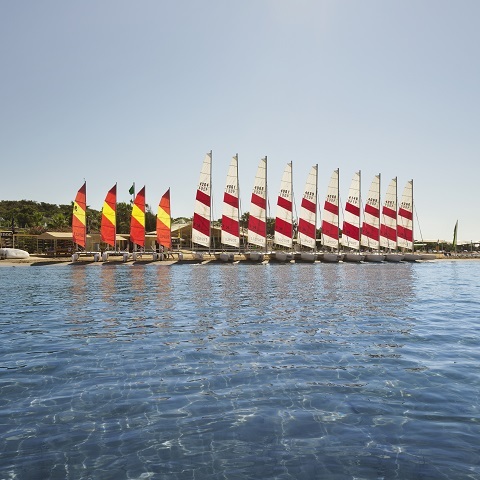 For 38 years now, TOPCAT has been producing beach catamarans for use in sailing schools across the world. As a manufacturer, TOPCAT offers direct support and supplies customers around the globe within the shortest possible delivery times. We apply our experience to help you put together the fleet you need, and as your flexible partner, we’re always at your side. TOPCAT offers three sail configurations for each model, designed to meet the needs of all sailors, from beginners to regatta pros: Classic, Streamcut and Regatta. If required, TOPCAT can also supply special sails conceived for strong wind or reefing. The roller furling jib is standard on all our boats. TOPCAT will offer you expert advice in deciding which sail is best for you. When landing or launching the boat, the sailor already has his hands full: letting out the sail, furling the jib, correctly assessing speed and distances, turning the boat into the wind.... not to mention still having to take care of the rudders. With the patented TOPCAT rudder system, the rudder blades are raised automatically if contact is made with the bottom. And once they are raised into the beach position, the catamaran can still be controlled and safely steered in shallow water. Sailing school boats and rental boats undergo heavy use. For one thing, the hulls have already been reinforced during production at critical points, such as the bow, stern, keel or spar passages - places that the customer can’t see from the outside. For another thing, the entire length of the keel is protected by replaceable keel shoes. Consequently, slipping along the bottom or accidental hard landings is hardly worth worrying about. Especially in sailing schools, damage is often unavoidable. However, hulls made of GRP can usually be repaired easily and at a low cost. GRP has a significantly longer service life compared to PE. With a little care and polish, TOPCAT hulls look like new even after many years passed - and make a good impression on both customers and anybody else who may be interested! Thanks to the simple modular principle, all features can be retrofitted at TOPCAT. For example, the unique Furling Gennaker, which is available for all TOPCAT models. The catamaran can be used for beginners level as well as for advanced courses. This flexibility provides a cost-effective added value for the school and guarantees customer loyalty: A TOPCAT can grow with the customer's skills and new incentives can be put in. The models K1, K2, K3, K4 all have parts which are 80% identical. That means there’s a perfect configuration for every purpose – whether for schools, rentals or advanced sailing. And that eliminates the need for a large and expensive spare parts storage facility.